PARIS—The French capital awoke and started a new week after a weekend full of darkness. The conversations were all still imbued with the attacks of Friday night. “Life goes on, we must continue to live,” is a common refrain, also used in a tweet by the French president as well as by passers-by scribbling on walls or monuments. Parisians would like to move on. Generally, in any serious event, there is an ending, or at least we know what to expect. Over three days, we know 168 administrative searches were conducted, seven terrorists were killed, four were identified, and one fled. However, the conclusion is conspicuous by its absence. Because these attacks primarily mark a confirmation, the logical continuation of what had happened in January, during the attacks of Charlie Hebdo. False alarms have been reported, which says a lot about the yet palpable tension under the Parisian sky. 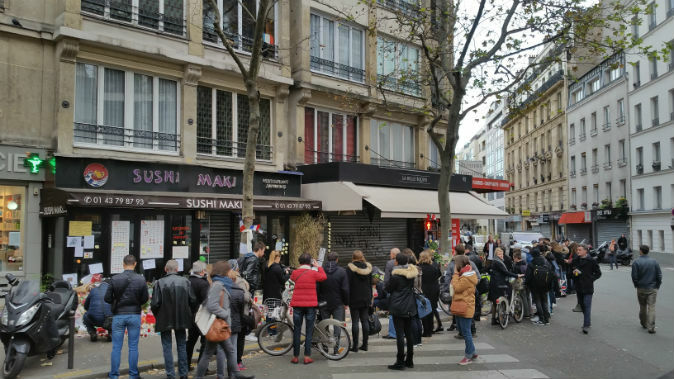 Saturday night, the night after the attack, firecrackers went off at a wedding near the Marais historic district creating panic in the Place de la République, where many Parisians gathered to mourn near the main monument. In the district of Jaurès/Stalingrad, police also reported “collective hysteria” following a false alarm. 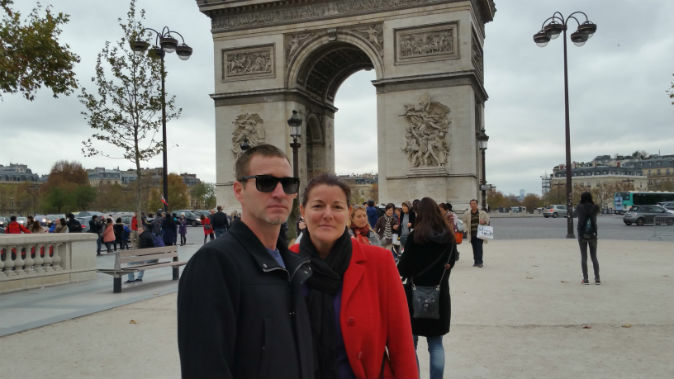 As one Parisian, Lea Morrin, said, it’s not the first time the French are living through this kind of drama. “The only positive side is this solidarity that emerged after Charlie Hebdo, and we see here, there are Japanese, Americans, so many people who come and gather, we don’t see that everyday,” said Morrin, who still hopes that security will be strengthened. “We always think it happens to others, but not to us. After Charlie Hebdo, it was expected. It was the trigger, I think that after that, we were prepared for this eventuality. Where? How? We didn’t know, but we knew it could happen,” said Stacy Gaultier, expressing a similar sentiment. At 90 Charonne St., emotions are still very strong three days on. 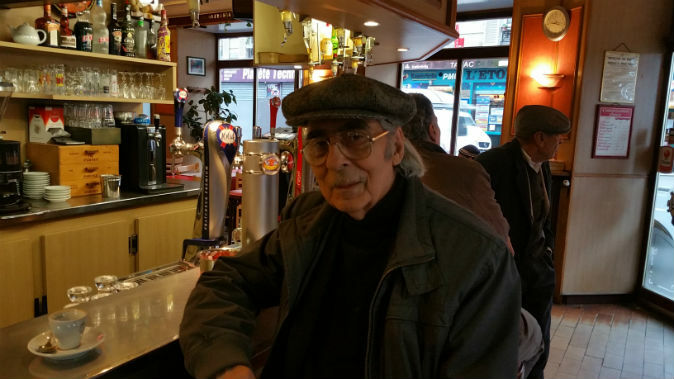 Everyone at the bar La Belle Équipe knows someone who saw what happened, and many knew someone who died. Mohammed Elkrif, 60, struggles to recover from what he saw. “In this bar, when there is a birthday, everyone comes and celebrates. This time, it was the boss Myriam’s birthday, there were so many people,” he said. Elkrif had called the owner of the store next door at 7:30 p.m., asking if he was going to close up and come over. “He answered: ‘I will, after the prayer.’ Then I called again, I asked him to close and come. He therefore closed his store at 9:30 p.m. At 9:37 p.m. there was gunfire,” recalled Elkrif. That was is when the black Volkswagen Polo burst onto the scene. A man got out of the rear left door and sprayed bullets randomly on the people sitting there. Then he left, leaving death and chaos behind. “A friend came and took a girl in his arms—it was Oda Yana, Myriam’s sister. I thought she was dead,” said Elkrif. At the hospital later, they said she was injured. “But we don’t know where she is right now,” said Elkrif adding that he was still without news about others too. Unfortunately, news about Myriam was confirmed—she had died. On the window of La Belle Équipe, drilled with terrorist bullets, passers-by slipped roses and tulips. There are also children’s drawings left with bouquets of flowers. “There are no words… We put ourselves in the families’ shoes, we put ourselves in the people shoes of those who were there, who were unable to do anything. It is unclear what’s going to happen in the coming days. We are going to live with fear. But can we live like this?! 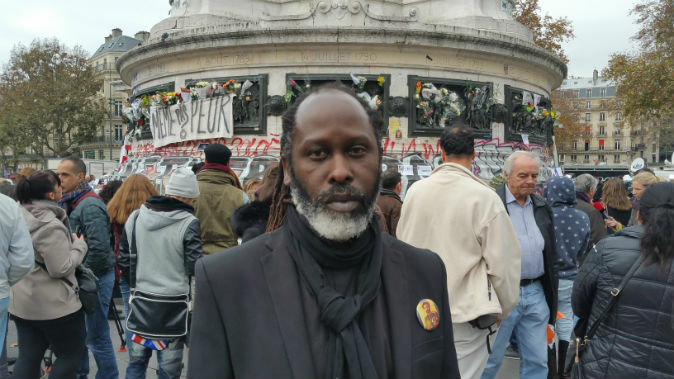 We lost a cousin, an Ivorian security guard who worked at the Bataclan,” said Elkrif. On the Place de la République, the usual noisy, congested Monday traffic didn’t distract the group of people gathered around the monument. Three concentric circles formed and gradually grew around the monument’s statues: one circle of candles and flowers, another of Parisians and visitors, the final one of cameras and journalists’ vehicles. At noon, the square was packed with people. After a minute of silence, there was applause, and everyone leaves. Traffic resumes. “I think that before, people knew it was necessary to fight terrorism, but now we see it in all its horror. This will probably bring Europeans closer to each other. 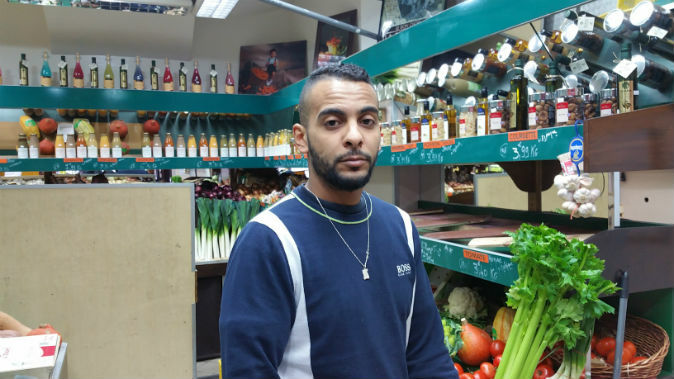 … Everyone feels ready to support France now, maybe it is a sign that shows us we must join forces to take care of each other,” added the young Swed. It’s Monday after the attacks, as police look down from the top of Montmartre funicular, things seem more normal. There are families with children playing, although still, not many people smile. At the Champs-Elysées-Clemenceau subway stop, gendarmes, police and military meet, shake hands like football teams before the game. Some will come across each other again during the day. In the late afternoon, two subway lines are completely blocked, and service on two other lines is disrupted due to bomb threats. “Our officials are working on a suspicious package at Oberkampf station,” says a voice through the loudspeakers. Parisians are accustomed to “parcel bomb” and late subways. Military patrols, equipped with Famas assault rifle are also part of the decor. “We live in a world that is no longer the ’50s,” he says regretfully. “France of the ’50s was wonderful. It’s all over, I know the difference. I lost one of my friends at the bar La Belle Équipe. He was having a coffee as I often do. I could have been with him, but I was at the Louvre, I have been so lucky,” he said, staring into the horizon. Read original article in French here.